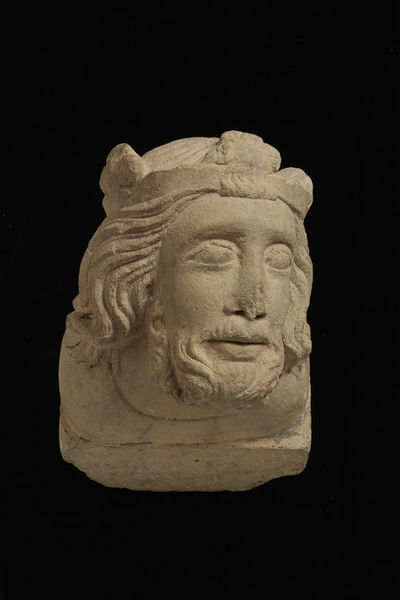 This type of head sculpture developed from the late twelfth century and was prominent throughout the thirteenth, and although found on the continent the production in England was more prolific. Head sculpture varies in form from grotesques and "masks" to faces which appear to be actual portraits, and this variety may be a reflection of the new interest in physiognomy encouraged by the availability of translations of classical treatises on the subject. The shape and depth of the block to which the head is attached indicates that perhaps it came from a hood mould of a doorway, where it would have been positioned facing an accompanying head, in the same manner as the heads of a bishop and prince above the north doorway of the Chapter House vestibule of Salisbury cathedral. A projecting head on narrow shoulders, with an uncarved block, which would have been recessed into the wall. The bearded king wears a crown with three crests in the form of channelled trefoils and facing to the left. The beard is flattened beneath the chin, fitting neatly into the depth of the block; the long hait sweeps back over the shoulders and is cut away at the back of the head. The tip of the nose is broken and a section at the back of the block is missing; there is also some surface chipping, but otherwise the sculpture is in good condition. This corbel was cleaned during long term loan to Canterbury Museum, and only a few traces of polychromy remain. (White and grey pigment around the eyes, brown and black in the hair and red on the shoulders). However, this paint is not original and it tallies with that found on the broken portion of the accompanying bishop's head corbel (A.93-1916). Royal Architectural Museum, Architectural Association, London, until 1916 (inv nos. 141 and 142; date of acquisition unknown, but certainly in the collection by 1877) transferred to the Victoria and Albert Museum in 1916. 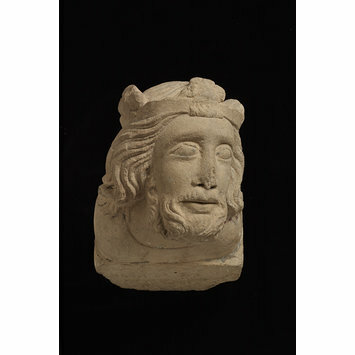 This type of head sculpture developed from the late twelfth century and was prominent throughout the thirteenth, and although found on the continent (e.g. at the cathedrals of Reims and Burgos) the production in England was more prolific, reflecting a taste which was widespread throughout the country. There are notable examples at Wells, Worcester, York Westminster Abbey, Rochester and particularly Salisbury where heads were used to terminate mouldings in the main arcading of the building, on hoodmoulds over doorways and on the choir screen (the remains of which is now housed in the north-east transept). Head sculpture varies in form from grotesques and "masks" to faces which appear to be actual portraits, and this variety may be a reflection of the new interest in physiognomy encouraged by the availability of translations of classical treatises on the subject. The size and style of this head and bishop's head A.93-1916, indicate that they were carved as part of the same ensemble; both have a slightly prominent upper lip and a tuft of hair on the forehead which is swept back over the headdress, similar to that on the head of a bearded man on Salisbury choir screen. Their small scale suggests that they could have come from such a screen, but the shape and depth of the blocks to which they are attached indicates that perhaps they came from a hoodmould of a doorway, where they would have been positioned facing each other, in the same manner as as the heads of a bishop and prince above the north doorway of the Chapter House vestibule of Salisbury (These are Victorian replacements but presumably reflect the original arrangement). Both heads are angled slightly forward and it is therefore likely that they were intended to be viewed from below. The provenance of the heads is not known, and such sculptures were found in cathedrals and small parish churches throughout the country during the thirteenth century. However, corbel heads are virtually always carved from the same stone as the surrounding architectural mouldings, probably executed by masons along with the wall stones. and as the present example are made from a minor variety of Oolitic limestone they probably come from a parish church local to the quarry. Paul Williamson dates the object to about 1260 on the basis of a reasonable similarity to the more generalised heads of the Salisbury choir screen and a head of a king in the nave.